The way technology has evolved, it has suddenly made our hands more active.The constant typing on the laptop or messaging on the phone has unknowingly leaved us with a new disease. some of these people have been advised complete rest from computers and phones because they are suffering from a little known condition called carpal tunnel syndrome. “Carpal tunnel syndrome is more common among people who use computer systems and keyboards excessively,” says Dr PR Krishnan, consultant neurologist at Fortis Hospital, Bangalore. What’s carpal tunnel syndrome, and do you have it? It’s a condition that causes intense pain, numbness and tingling in your arms. “The condition occurs when the median nerve is compressed as it travels across the wrist. Some of the symptoms to watch out for are numbness and tingling of fingers, weakness of wrist, occasional shock like feeling that travels through your fingers,” says Dr Krishnan. The other symptoms include: weakness of hands, i.e. whenever you try to lift something, you end up dropping it and pain that travels from forearm to shoulder. It is important to note that carpal tunnel may not be directly caused by repetitive activities such as playing a musical instrument, playing a sport or typing. 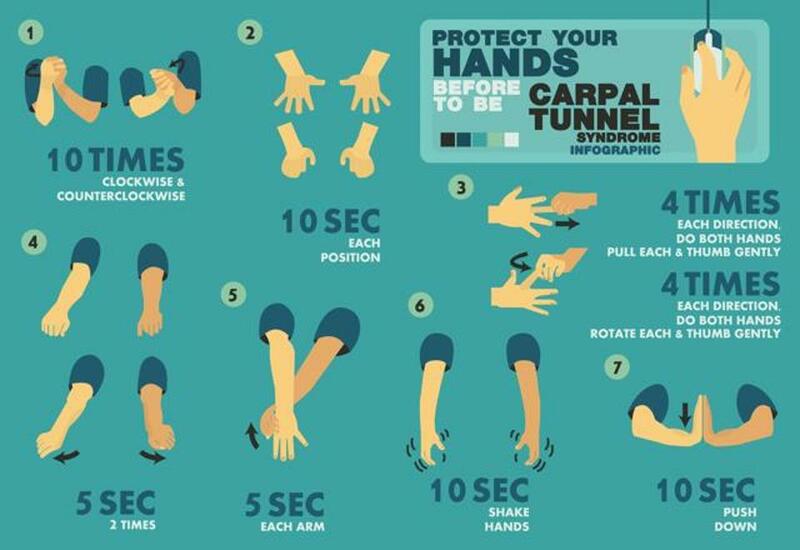 But these activities may cause tendinitis in the hand, which can narrow the carpal tunnel and lead to the symptoms. It is best to get yourself checked if you’ve experienced any of these symptoms. Take breaks, exercise: According to Dr Krishnan taking a 3-5 minute break every hour will help. “Attempt hand and wrist exercises often. And avoid using more force than necessary to perform tasks,” he says. -Make a fish and hold it as tight as possible. Release your fist and point your fingers towards the ceiling. Do 10-15 repetitions. -Make a fist, open it and create the letter O using all fingers. Wear and wrist splint: Dr Krishnan suggests wearing a wrist splint at night. The splint holds the joint in a neutral position.